The Civil Society Forum of the Global Environment Facility (GEF) took place on June 26th, 2018 preceding the Sixth Assembly of the GEF in Da Nang, Viet Nam. Over 120 CSOs and other participants (governments, agencies and private sector) met to highlight the crucial role that civil society plays in positively influencing the future of the global environment and contributing to the implementation of GEF-7. 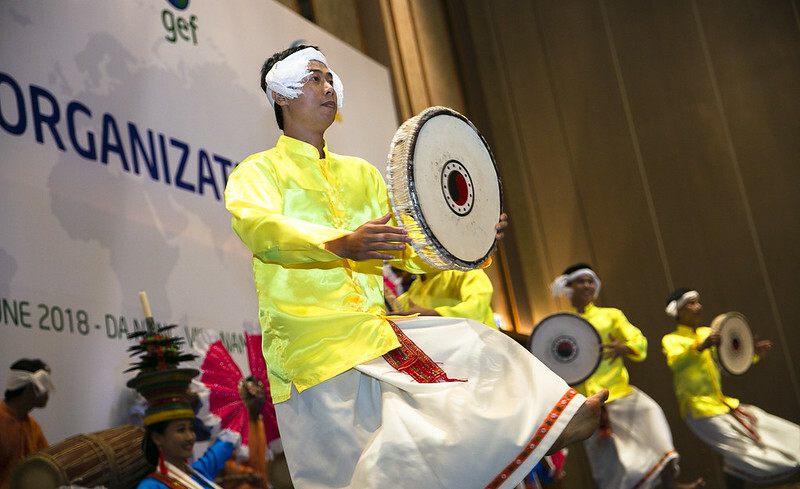 The Civil Society Forum showcased experiences and projects from around the world that contribute to foster partnerships amongst the different sectors of the GEF’s member countries. Under the overarching theme of: Partnerships for Transformative Change: Civil Society’s Contribution to Transforming Systems to Safeguard the Future of Our planet, the Civil Society opened with a traditional Vietnamese dance comprised by three performances :Tamia đwa buk – (Dances carrying water jar on the head); Melodious Saranai trumpet – ritual musical instrument played in many festivals of Cham villages; and Drum beat of Ginang – a unique musical instrument usually played at the traditional festivals of Cham people. The happy and festive performance set the tone for the rest of the day. Participants were greeted by Ms. Naoko Ishii (GEF CEO), Mr. Le Cong Thanh (Vice-Minister of the Ministry of Natural Resources and Environment, Government of Vietnam), Ms. Lucy Mulenkei (Chair, Indigenous Peoples Advisory Group), Mr. Victor Kawanga (Chair, GEF CSO Network) and Thu-Huyen Thi Nguyen, National Coordinator, Viet Nam GEF Small Grants Programme (SGP). This breakout session showcased examples of effective collaboration between civil society/IPLC, governments and the private sector, and will highlight innovative multi-stakeholder partnerships at local, national or regional levels that have contributed to sustainable energy, food production or other areas with positive impact in terms of accountability and good governance for system change. Advocacy and innovative thinking and practice from civil society is needed to achieve transformation of the unsustainable economic systems that are driving the planet’s environmental degradation. This session showcased examples of innovative tools and mechanisms used by civil society and indigenous peoples and local communities in achieving these transformations. The session engaged representatives from civil society, grassroot and women’s organizations, government and the GEF partnership in an informal discussion on how to ensure effective stakeholder engagement and promotion of gender equality in GEF programs and projects, and ways to practically operationalize GEF’s new Policies on stakeholder engagement and gender equality in GEF-7 and beyond GEF’s policies and guidelines into practice. In making a transformational change of the GEF CSO Network (GCN) to function as a strong and active civil society network in the GEF systems, there is a progressive need to engage the network within the context of multi-focal dimensions. The GCN aims to strengthen the members at country levels, empower the national and regional elected Regional Focal Points and IPLCs representatives along with a well-functioning GCN secretariat. The presentation talked about experiences and effective collaboration between available community mechanisms between GCN and the greater civil society, IPCLs, governments, private sector and line actors at local, national, regional and global levels to accelerate the achievement of the global environmental benefits. The Civil Society Call for Action was prepared with inputs from civil society and indigenous peoples and local communities who are members of the CSO Network, other CSOs, CBOs and IPLC of the GEF SGP and other GEF projects, IPAG, and other civil society participants attending the Assembly. The Call for Action was delivered to the Assembly Plenary by Priscilla Achakpa, Women Environmental Programme, Nigeria, and it can be found here. The GEF Small Grants Programme (SGP) hosted a reception to celebrate its 25th Anniversary after the Civil Society Forum on Tuesday evening. Yoko Watanabe, Global Manager, SGP, welcomed participants to the reception by emphasizing the value of the SGP to the GEF and the global environment in the last 25 years, as well as the power of community action. Ms. Adriana Dinu, Executive Coordinator, UNDP Global Environmental Finance Unit and Mr. Tran Hong Ha, Minister of Natural Resources and Environment, Viet Nam, also delivered their words to mark the anniversary, highlighting the role of civil society and communities and the valuable innovations that the Programme has spearheaded. The reception concluded with a dance and music performance by the Co Tu Indigenous Peoples of Da Nang.